Posted March 10, 2015 in Uncategorized. 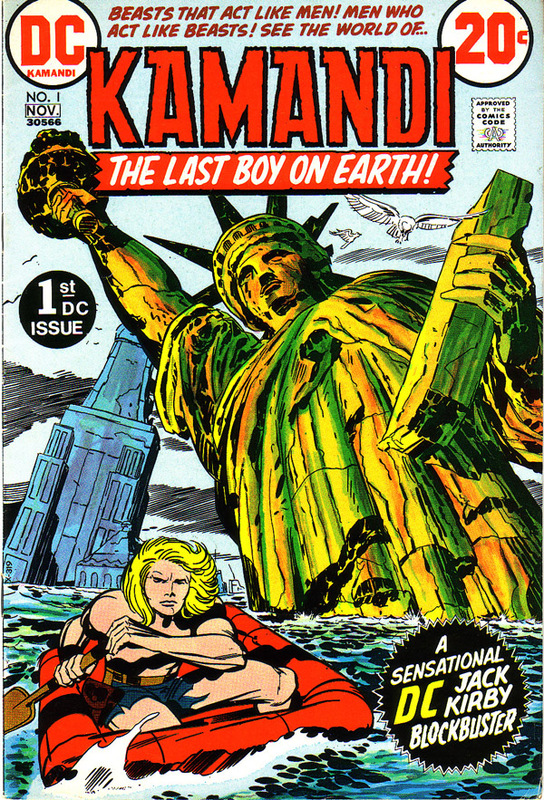 Let us focus on Kamandi, the longest running series that Kirby produced for DC Comics in the 1970’s. Kamandi was a very entertaining and imaginative run of comics and somewhat Swiftian in its use of satire. This combination of fun and intelligence was the reason that it lasted as long as it did. As most people know, this concept was Kirby’s riff on Planet of the Apes, and the cover above with its half-sunken Statue of Liberty certainly conjures that film. This is a powerful image, with the Empire State Building as the point from where the figure of Kamandi emerges, and Lady Liberty’s tilted stance gives that figure diagonal and forward trajectory as he resolutely paddles his raft in our direction. 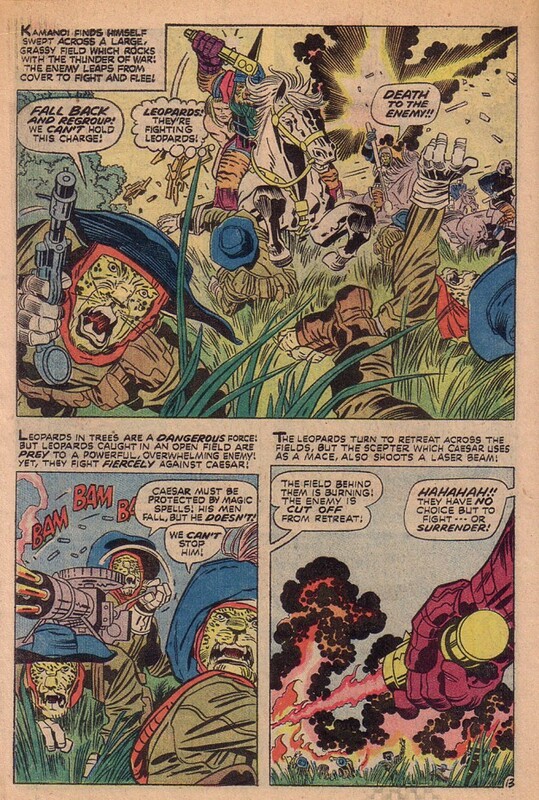 Kirby is still at the height of his powers as he gives us this gem of a composition above, on panel 5 of page 12 of the first issue, as Kamandi is carried along by a tiger on horseback. 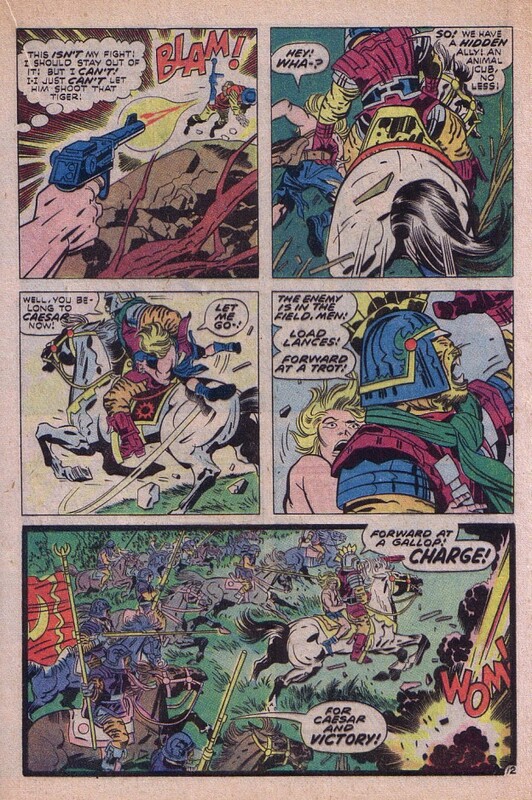 The strategic placement of riders gives maximum momentum to the lead horse carrying Kamandi. The amazing this is that despite the fact that the eye is moved from left to right to emphasize the direction of the action, there is still a circular sweep that brings the eye back around. This way you first see the tiger known as Caesar’s exhortation to charge and then the other riders yell of victory. On the following page above, we see the leopards fleeing towards us as Caesar charges forward. The challenge here is for Kirby to create his usual forced perspective magic. He succeeds by using the slight diagonal of the horse’s position reinforced by the gun-weilding leopards angle, the fallen leopard’s raised arm, the leg in the lower right quadrant and the explosion at upper right that throws force lines rightward and upward. Even the blades of grass at the bottom of the panel serve the same purpose, to move the rider out of the panel and in your face. Kirby delighted in running these creatures through their paces and as a result, Kamandi was one the most playful and animated series that he produced. Here’s an early example of Kirby’s animal men from Alarming Tales #1. Harvey Comics September 1957, an all-Kirby issue I believe.